Based on extensive research, Blacksnake’s Path combines a compelling narrative with authentic history. This splendid novel about an unsung hero of American history is the product of twelve years of research and writing, yet it carries its prodigious learning lightly in order to tell vividly the story of William Wells’s remarkable life. Blacksnake’s Path recreates an entire period (1779-1812), showing how the Indians lived, fought for their homeland, and dealt with defeat. Because Wells was always a man in the middle, moving between two cultures, the novel also captures the lives of the men and women who settled the territory north of the Ohio River. In 1784, when he was thirteen, Wells was captured from his home outside pioneer Louisville and taken to Snake-fish Town in present-day Indiana. There he was adopted by the village chief, The Porcupine, and was raised as a Miami under the name of Blacksnake. He experienced a vision quest, learned to hunt, went on the warpath, married, and fathered a son. On November 4th, 1791 he fought by the side of the great Miami war chief Little Turtle at St. Clair’s Defeat, the greatest victory the Indians ever won against the U. S. Army. His second wife was the chief’s daughter Sweet Breeze. Two years later he switched sides and became head scout for General Mad Anthony Wayne at the decisive battle of Fallen Timbers, August 20th, 1794. The following summer he was the translator between Little Turtle and Wayne at the Treaty of Greenville, which ceded most of Ohio to the settlers. For much of the rest of his life, Wells served as Indian Agent for the Miami, taking Little Turtle and other chiefs to visit Presidents Washington, Adams, and Jefferson in Philadelphia and Washington. In the early nineteenth century, he was often at the center of the conflict between Governor William Henry Harrison’s land greed and Tecumseh’s militant resistance. Wells died a martyr at the Fort Dearborn Massacre in 1812. 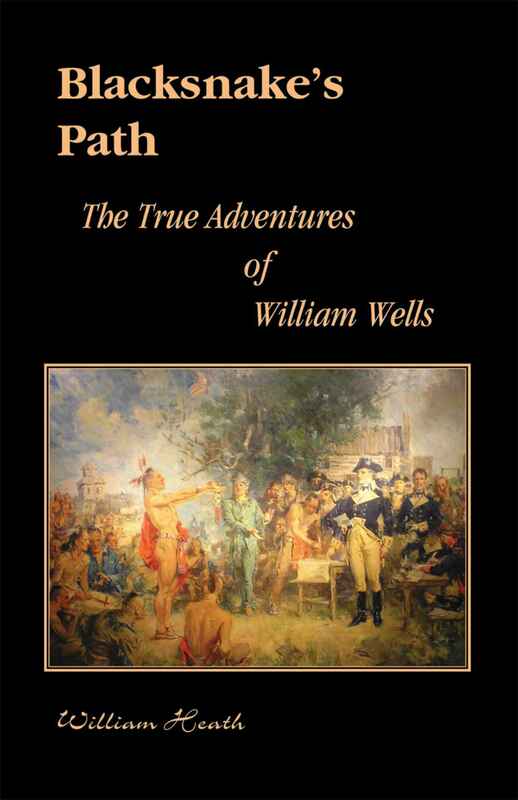 Blacksnake’s Path tells the remarkable story of William Wells, an Indian captive turned Indian fighter-scout-spy-translator-negotiator-agent, in a way that alters our sense of American Indian history. As a man in the middle of two cultures, Wells gives us eyes into the powerful role Native Americans played in diplomacy as well as battle. Novelist William Heath balances his astonishing portraits of Indian fighters like Mad Anthony Wayne and William Henry Harrison with equally stunning portraits of Little Turtle and Blue Jacket and Blacksnake to show us less recognized but crucial ways that Indians forged the larger history of the United States. —Frank Bergon, author of Shoshone Mike and editor of the Penguin Classics edition of The Journals of Lewis and Clark.